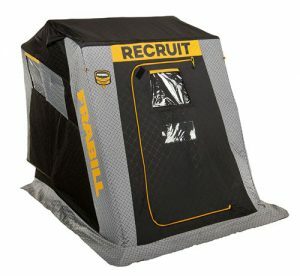 A portable ice fishing shelter keeps you out on the ice, fishing longer, and when you fish longer, you catch more fish. There are numerous options of ice fishing shelters, houses, and tents for sale, but we feel the portable ice shelter is the best option for most ice fishermen. We have researched all the options for portable ice fishing shelters, with warmth, portability and durability as the highest priorities, and recommend Otter XT Cottage Ice Shelter as your best option. In addition to our best ice fishing shelter pick, we have identified some other ice shelters for specific needs such as insulated ice fishing shelters. We have included the best ice fishing tent, the best flip over ice shelter, the most portable ice fishing shelters, the best budget ice fishing shelters that are cheap, the best hub ice shelter, and the best ice fishing sled shelter. 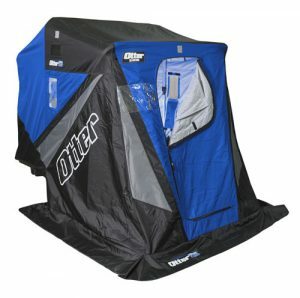 The Otter XT Cottage Ice Fishing Shelter is the best combination of portability, warmth, and durability available. The Otter XT Cottage is a flip-over, portable style ice shelter with telescoping oversized square tube aluminum frame, anodized receiver tubes and Ultra-Glide system. Although this model is pricier than most other models on our list, we feel the price is warranted. One of the best features the Otter provides is the heavy duty exterior skin. It locks in heat allowing you to turn down your heater, even remove some of your winter gear, and fish for longer. Surprisingly, the heavy duty skin doesn’t add a lot of extra weight, making these ice shelters the best combination of warmth and portability. In addition, if you are looking for an ice shelter that will last for years to come, this is your best option. Specific features of the Otter XT Cottage ice shelter include: Ultra-Wide 16.8 sq.ft. space comfortably holds one fishermen with room to spare, Otter Thermal-Tec™ 600-denier layering system blocks light and wind while its quilted thermal inner shell locks in the heat and reduces condensation. This ultra-durable, triple-layer shell also reduces condensation, keeping you warm and comfortable through the coldest days on the ice. Flip-Up Cushioned Bench Seating System. Front Entry Door with Dual Coil Zippers. Sled Features Molded-In Hitch Pockets. 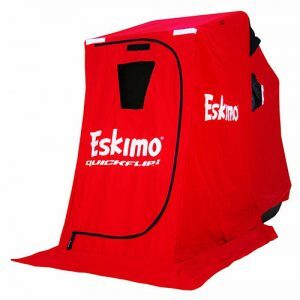 The Eskimo Quickfish 2 Hub Style Ice Fishing Tent is a popular ultra portable option for an ice fishing shelter. It allows you to carry the ice fishing tent on your back without the use of an ATV or snowmobile to tow it. The hub design of the QuickFish makes for an easy and quick setup and takedown. Eskimo boasts that setup is only 60 seconds. The relatively small pack also allows for easy storage. So if you are looking for an extremely portable ice fishing shelter that can be carried on your back without an ATV or snowmobile, can be setup in 60 seconds, and have storage limitations, this is your best option. Features of the Eskimo Quickfish 2 are: Removable windows allow you to adjust your shelter’s ventilation. Perfect for two people, the QuickFish2 has 25 square feet of fishable area, mesh storage pockets to keep your essential ice fishing gear, and an extra long skirt to help eliminate drafts on those cold winter days. The Eskimo’s skin is IceTight fabric that features a 59% higher thread count than comparable shelter skins. This higher thread count results in a tighter weave, and offers the wind and watertight performance that Eskimo is known for, at an average weight savings of up to 19% over most competitors. An extra-long skirt helps eliminate drafts and keep the elements out. 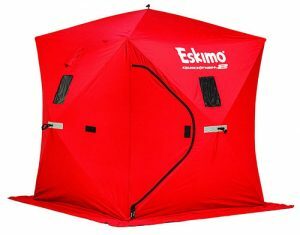 The Eskimo QuickFlip 1 Flip Over Ice Shelter is another ultra portable option for an ice fishing shelter. We chose this model as our best one-man flip over ice shelter because not only is it portable but it is a cheap ice fishing shelter. Eskimo is a great brand with a great reputation so it is important to not confuse a cheap price with cheaply built. This Eskimo QuickFlip is well built and a great value. The features we like most include: The durable folding ice chair (included) is lightweight and can be used inside or outside the shelter. The aluminum poles are connected to a double-walled hinge bracket, which add strength and durability without adding additional weight, keeping the QuickFlip 1 light, weighing only 47 pounds. Designed with a windbreak mode, this shelter is easy to flip up and use as a windbreak on sunny days. 2 removable panel windows allow you to Adjust your shelter’s ventilation with detachable hook and loop windows. The Eskimo QuickFlip skin is a 300 Denier IceTight™ fabric with a 59% higher thread count than comparable shelters. This higher thread count results in a tighter weave, and offers the wind and watertight performance that Eskimo is known for, at an average weight savings of up to 19% over most competitors. Heavy-duty material is sewn over corner joints for reinforcement, and YKK® zippers are standard on every Eskimo shelter. As we mentioned above, flip up style ice shelters are an extremely popular style ice fishing shelters. 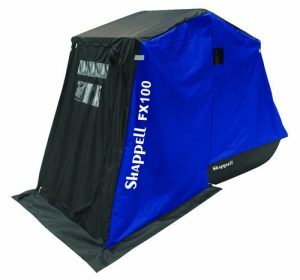 The Shapell FX100 missed our top pick for the one-man flip over style ice shelter because it is slightly more expensive that the option above. The features of this ice shelter include: Solid One Piece Instant Flip Frames. Extra Wide Front Frame for more Fishable Area. Wide Body Sled Base. Full Width Padded Sliding Bench Seat. Front Zipper Door. High Visibility Reflectors. Heavy Duty 600D Polyester Fabric. A Windbreak Position option. At just 37 pounds, it’s sled base allows you to pull the ice fishing shelter without the use of an ATV or snowmobile to tow it. However, with the addition of a tow bar (not included) and an otpional wear bar kit, this ice fishing shelter can be towed. The easy-to-set-up flip design of the FX100 makes for an easy and quick setup and takedown. So if you are looking for an extremely portable ice fishing shelter that can be moved around without an ATV or snowmobile, can be setup quickly, this is another great option. This particular flip-up ice fishing shelter features: Front Door. Boat Seats. Lightweight and durable materials. Improved storage and organization. Optimized fishable space. Patented Modular Seating System. Well-placed windows and openings. Contemporary Styling. Full Insulation. 16.5 Fishable Sq. Ft. The Eskimo EVO IT combines a sled style ice fishing shelter with the durable hubs from Eskimo’s pop-up shelters and what you get is the ultimate ice fishing shelter for one person. 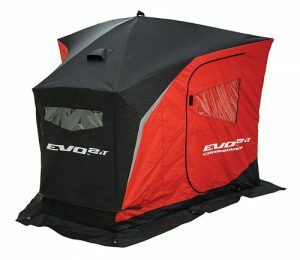 The EVO IT provides a large fishing area because of it’s unique crossover features and design. While offering great portability and a spacious interior, the EVO IT introduces IQ insulated fabric roof and rear panels. The IQ fabric is colored black to help absorb and hold heat, keeping the ice angler warmer in frigid conditions. 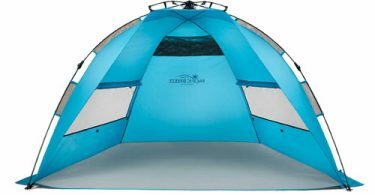 A full description of features include: The EVO iT gives you more fishable area than any comparable sled-style shelter by utilizing fiberglass poles and hub technology to extend the shelter walls beyond that of a standard flip shelter. By replacing bulky metal poles with fiberglass poles, the EVO iT keeps weight to a minimum and makes it always easy to transport. The extra-large windows and coverings on the EVO iT allow you to control the amount of light being let into your shelter and gives you visibility to all parts of the ice without having to leave your seat. With extra headroom where you need it, setting a hook inside your shack has never been easier. The EVO1 iT features an oversized side door, making it easy to move yourself and all your gear in and out of the shelter. The side position of the door allows you to enter and exit without having to step over your holes. 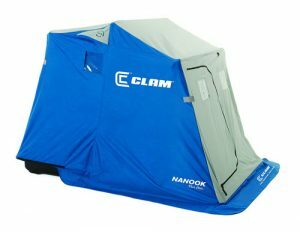 The Clam Nanook 2-Person Ice Fishing Sled Shelter has been one of Clam’s most popular ice shelters. In fact, Clam says that this exact model is the Number one selling shelter on the market! The features of this ice shelter include: Fast flip-and-go pole system (no extension tubes). Lightweight two-person shelter. Perfect to take a child or fishing buddy! Tough 450 denier fabric. Low profile fish house for two anglers. Includes two padded folding swivel seats that fold that move front-to-back, left-to-right and are removable. Front and rear access doors. Includes 14” X 30” overhead mesh storage and storage hammock. OutsiderGear.com is a participant in the Amazon Services LLC Associates Program, an affiliate advertising program designed to provide a means for sites to earn advertising fees by advertising and linking to Amazon.com. We also receive compensation for products and services that are not associated with Amazon.